That's a big takeaway from a report released Monday that examined data from nearly 22, 000 firms in 91 countries. - 60% had no female board members. - Half had no female top executives. - More than 95% did not have a female CEO. Interestingly, though, companies with a dearth of female executives may be paying a financial price. The report found that companies where women accounted for at least 30% of their executives typically had higher profits than those that had less female representation in top manager roles. "The impact is the biggest for female executive[s], followed by female board [members], with the presence of female CEOs having no noticeable effect, " authors of the study wrote. Another finding from the study may be particularly compelling to anyone - male or female - who wants both a corporate career and a family. Paternity leave was strongly correlated with a higher representation of women on corporate boards. 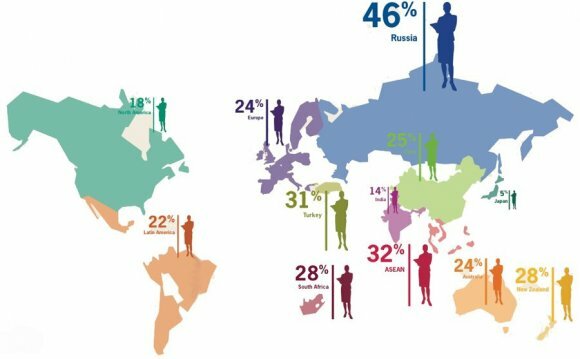 The 10 countries with the most gender-diverse corporations - including Norway, Latvia, Finland and Sweden - offered 11 times more paternity leave than the bottom 10 countries (Australia, Pakistan, Canada and Japan, among others).